The Phoenicians came from the eastern shore of the Mediterranean Sea; land that is present-day Lebanon. Their homeland was arid and inhospitable for farming, so the Phoenicians turned to the sea to become the greatest travelers and traders of their time. The Phoenicians invented the alphabet and taught several cultures their advanced system of writing. Carthage developed from a Phoenician colony of the first millennium BCE into the capital of an ancient maritime trading empire. The Phoenicians built a trading post in North Africa they called Carthage. The Phoenicians chose Carthage because it was located in the center of North Africa, a short distance away from Sicily and the Italian Peninsula. When the Assyrians and the Persians conquered the original homeland of the Phoenicians, Carthage became an independent state. Carthage grew to become one of the mightiest cities of the ancient world, but the city was destroyed after three brutal wars with the Italian city-state of Rome. 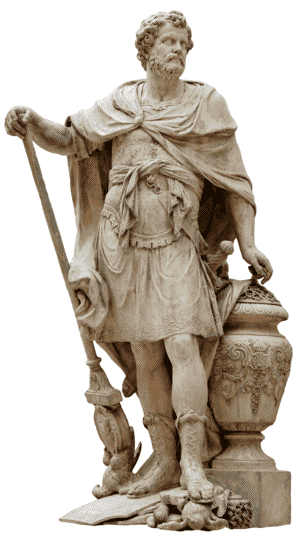 The wars were known as the Punic Wars because Punica was the Roman name for Carthage. The Roman Navy surprised the sea trading people by winning the first war in 238BCE. The Carthaginians acquired a new base in Spain from which a great military leader named Hannibal led a team of elephants across southern France and into Italy. Hannibal won some early victories, but his forces were outnumbered, allowing Rome to win the brutal fifteen-year war that ended 204BCE. Carthage lost all political and military power by the end of the second Punic War, but the Romans moved a half-century later to destroy what was left of the city. The Roman army did not attempt to break down the walls surrounding Carthage, but they did surround the city and lay siege to Carthage for three years. Finally, in 146BCE, the Romans broke through Carthage’s city walls and went from house to house slaughtering the Carthaginians. The few survivors were sold into slavery, and the Romans destroyed Carthage and its harbor. Mr. Donn has an excellent website that includes a section on Africa. 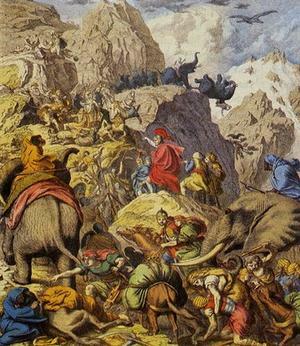 In 218BCE, a generation after the first Punic War, Hannibal Barca led an army of 40,000 soldiers, 8,000 horses and 37 war elephants in a daring and difficult journey over the Alps. The Alps are a treacherous mountain range that stood between Spain and the Italian peninsula. Hannibal Barca (247 – 182BCE) was a Carthaginian general who is considered one of the greatest military leaders in history. This sculpture by Sébastien Slodtz (1704) is at the Louvre Museum in Paris, France.